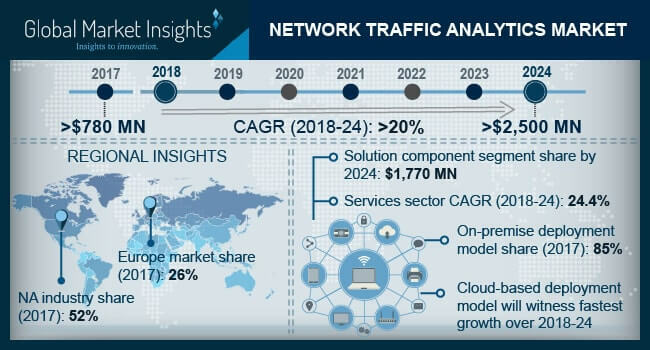 Network Traffic Analytics Market size is set to exceed USD 2,500 million by 2024, according to a new research report by Global Market Insights, Inc. The rapid growth in cloud-based traffic is mainly driving the network traffic analytics market. The IT industry has adopted cloud technology as a flexible networking solution to meet the increasing needs of enterprises and consumers. The cloud data center traffic is projected to rise exponentially from 3.8 ZB in 2015 to around 14 ZB by 2020. As the cloud traffic increases, there is a corresponding increase in the need to monitor, manage, and secure the ever-growing big data. Owing to this, the network traffic analytics for cloud auditing is important so that the users can maintain their information security on the network. For instance, in April 2017, SoftBank, a Japanese telecom leader invested USD 16.5 million in Dome9 Security, an Israeli company offering cloud infrastructure security services. Organizations across the world are witnessing threats due to the increasing number of cyber occurrences and their ramifications. The cyber incidents targeted toward businesses increased from 82,000 in 2016 to approximately 159,700 in 2017, primarily driven by WannaCry ransomware and other attacks. To curb the rising cyber risks, organizations worldwide are investing huge funds in numerous data security tools and the overall spending on security solutions is projected to reach USD 113 billion by 2020. This huge spending in security has given a boost to the network traffic analytics solutions market. The on-premise deployment model held the highest market revenue of USD 670.1 million in 2017. As these models are installed within the enterprise, they offer high regulatory compliance and data protection. Furthermore, they assist in reducing latency, maintaining peak performance, and availability. Due to these advantages, companies are still relying on this platform and raising funds to expand their businesses. For instance, in April 2017, Sapho, a company in the U.S. raised USD 14 million to build a global sales team for expanding its business by serving large companies using on-premise models. However, the large capital investments, responsibility for maintenance, longer implementation times, and increasing data produced are the major factors that may lead to a steady growth of network traffic analytics market over the forecast timeline. The network security solution is growing at the fastest rate with a CAGR of 24.1% over the forecast timeline. Due to the rising advent of digitalization and the adoption of technologies, such as IoT and cloud computing, the amount of data generated grew tremendously. This growth in big data requires effective monitoring and storage as they fall prey to various malicious attacks. Therefore, network security solutions are used to detect and block malicious attacks throughout the network. The governments worldwide are investing funds and implementing rules and regulations to enhance the cybersecurity offerings of their country. For instance, in 2017, the Australian government invested USD 50 million over a period of seven years in the Corporate Research Center for cybersecurity. This investment will establish the country’s reputation as a secured market to do business, thereby enabling national security. The consulting services in the network traffic analytics market are growing at the fastest rate as they assist in managing cybersecurity throughout the product’s lifecycle by building a vigorous security strategy, identifying & evaluating threats, finding the network infrastructure vulnerabilities, and strengthening the security architecture. Furthermore, various companies operating in the network traffic analytics market are launching new consulting services to expand their service offerings and gain a share in the competitive market. In February 2017, NEC Corporation, a Japanese MNC delivering IT products and services, launched a consulting service, TMS Professional Service. This consulting service allows communication service providers to manage and devise strategies based on the analysis of their network traffic. The fastest growing segment in the network traffic analytics market comprises cloud service providers. These service providers are highly prone to cyber attacks due to the rise in the malware attacks including ransomware, banking malware, and scareware. Moreover, around 400,000 new malware attacks that target public clouds and SaaS providers and damage the critical data daily have been recognized. Hence, it is necessary for the cloud service providers to monitor network traffic, data movement, and application activity at all stages of the cloud environment, boosting the network traffic analytics market growth. The IT & telecom enterprises are anticipated to dominate the network traffic analytics market by 2024. The increased worldwide adoption rate of the internet with an enhanced usage of social networking platform and the rise in smartphone penetration rate are the major factors driving the network traffic analytics market demand. Telecommunication companies are investing millions of dollars and entering into strategic partnerships to boost their network traffic management platform, enhancing their service offerings and gaining a competitive edge in the market. For instance, in July 2017, KDDI Corporation, a Japanese telecom operator entered into a partnership with Kentik, a leading network traffic intelligence firm. This will allow KDDI to deploy the company’s Kentik Detect solution for real-time network monitoring and planning efficiencies. North America dominates the network traffic analytics market with a revenue of USD 411 million in 2017. The region is home to the most advanced software and IT industry including AT&T, Cisco, IBM, Amazon, Google, Microsoft, and Juniper Networks and is a world leader in the cloud computing market. Other factors contributing to the market growth include the accessibility to advanced infrastructure, the rise in the number of cyber-attacks, the emergence of IoT devices, and advanced technology adoption. The government is also investing funds in various technologies, which has a positive impact on the network traffic analytics market. For instance, the government of the U.S. is also planning to invest USD 10 billion in cloud computing technology by 2023. Due to the advancements in these technologies, the data traffic is projected to grow tremendously leading to an increase in the network traffic analytics market demand. The European network traffic analytics market held around 26% of the industry share in 2017. The region has the presence of some of the leading telecom companies in the world, such as Vodafone, SoftBank Group, and Telefonica S.A., fueling the market demand. Furthermore, the General Data Protection Regulation (GDPR) implemented by the government in May 2018 has laid down effective data privacy and security guidelines. This will prevent the companies from sharing the customer personal data without their consent and boosting the network traffic analytics market growth. New product launches and partnerships are the main strategies adopted by the companies operating in the network traffic analytics market. The prominent vendors functioning in the market include Allot Communication, Ascom Holding, Accenture, Bradford Networks, Cisco, IBM, Microsoft Corporation, Nokia Networks, Juniper Networks, Flowmon, Kentik, Huawei, Palo Alto Networks, Genie Networks, SolarWinds, Symantec, Zenoss, and Plixer.